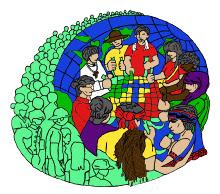 Kalikasan People's Network for the Environment (Kalikasan PNE), Defend Patrimony! Alliance and the National Council of Churches in the Philippines (NCCP) published the Mining Situation and Struggle in the Philippines to provide the status of the Mining Liberalization and its impacts in the perspectives of the people's movement. 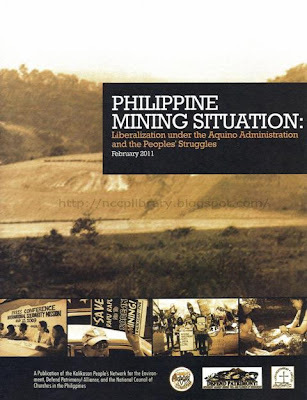 This document presents the continuing people's resistance and campaigns to protect their communities, fight for their rights, and the defense of the nation's patrimony against imperialist mining plunder. Limited copies available at the NCCP Databank. For copies please call the Office of the General Administration at (632) 929-3745 or send us a message on our Facebook Page. For more information on the life and ministry of the National Council of Churches in the Philippines please visit our website. To help you in locating the NCCP, We added a photo of the Council in WikiMapia an editable interactive map. The content of this blogsite is a random pick of materials submitted to the NCCP library and does not officially represent the position of the Council except where it is so stated. We would like to hear from you regarding the posts, do send us comments or you can email us at library@nccphilippines.org.